This tool outlines three types of classroom observations and provides leaders with a rationale and guidance for examining teaching practice in their schools. The Types of Classroom Observation tool helps educators understand the purposes and techniques for observations in education. By outlining the supporting theory, logistical considerations, and possible leadership actions behind the three types of classroom observations, the tool provides practical guidance for leaders to develop their expertise in examining teaching practice. 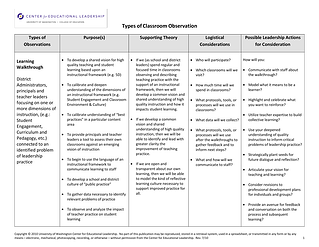 The Types of Classroom Observation tool is a companion to Chapter 4 of Leading for Instructional Improvement: How successful leaders develop teaching and learning expertise, by Stephen Fink and Anneke Markholt. The full chapter brings to life the three types of classroom observations using case examples, lesson observation scripts, memos, letters and other documents.